Explore a quieter but equally dramatic part of Cumbria on our June Yoga Hikes break to the North Pennines. We are based at the purpose built Haybergill Centre in the heart of the North Pennines area of outstanding natural beauty and have a packed schedule of hiking and yoga to enjoy all weekend long. There will be 4 yoga classes during this weekend, and in between a full day hike to explore this most beautiful area. The guided hiking, yoga classes, all accommodation, breakfast and lunch are included, plus dinner on Friday and Saturday. Yoga classes will be taught by Yen who is a fully qualified and experienced teacher and the hiking will be lead by Kevin, who is a fully qualified International Mountain leader. We both live in and love the Lake District so know the area extremely well and are very excited to be able to show this dramatic but little known area. High Cup Nick will be the highlight of our hike on Saturday and this has been described as ‘The Grand Canyon of the Pennines’ and is one of the finest u-shaped glacier carved valleys in England. There are fantastic views from the summit taking in the dramatic geological formation at the top of High Cup Gill. This Cumbria yoga hikes weekend will offer the best of both worlds, to get out walking enjoying the beautiful scenery in the North Pennines Area of Outstanding Natural Beauty and to practice yoga. There will be five yoga classes in total led by Yen, a fully qualified yoga teacher and personal trainer. There will be fully guided walks on both days led by Kevin, who is a fully qualified International Mountain Leader. We will be based at The Habergill Centre in the Upper Eden Valley on the outskirts of Cumbria and the Lake District for this Cumbria yoga hikes weekend. We are based within the “North Pennines Area of Outstanding Natural Beauty” with breathtaking views all around and within touching distance of the Lake District, Teesdale and the Yorkshire Dales. The Haybergill Centre is a private, hidden, purpose built, and inspiring Scandinavian style venue. The centre comprises a main building, an annex, a pod and an arctic bbq cabin, all set in large mature woodland. The owners have a long term commitment to running a sustainable, ethical, family business. It has a fantastic modern space for yoga and so is ideal for our Cumbria Yoga Hikes group and we have the centre for the sole use of our group during our weekend. During our spare time guests can enjoy the grounds and the close surrounding countryside, bird & other wildlife watching, walking. There is also a sauna and a stunning garden cabin and a purpose built open fire pit which guests are free to use. We have our own dedicated yoga room on the ground floor looking out over the gardens. We offer a welcome yoga class on Friday evening and 3 other classes and we will stretch out our legs on an energetic hike in between. The yoga is varied and so will be suitable for beginners as well as for those who have practiced before. Sessions will take place on the Saturday and Sunday, before breakfast and after we return from our walks on Saturday and Sunday. The general focus of the morning sessions will be to energise and warm up the body for our walk, and in the evening, will be to stretch out those tired muscles and relax the body. Yoga mats and props will be provided but you are most welcome to bring your own mat if you prefer. We have a fantastic choice of stunning walks available directly from the Habergill Centre exploring lesser known areas of the North Pennines. On Saturday we will set off from the ancient village of Dufton in search of one of Britain’s best kept secrets – the Grand Canyon of the North, or High Cup Nick, a magnificent hanging glaciated valley, that’s been 500 million years in the making. A true highlight of the Pennine Way, it was described by walking legend, Alfred Wainwright, as a ‘natural wonder’ and ‘unforgettable sight’. High Cup Nick is at the top of a stunning glaciated valley, with mesmerizing views over High Cup Gill. With over 16 million people visiting the nearby Lake District each year, and with just 6000 getting up to High Cup – the Grand Canyon of the North is a very well-kept secret. All meals are included in the cost of the weekend : Friday, Saturday diner ; Saturday and Sunday breakfast and packed lunch each day. There will also be homemade cake with tea and coffee when we return from our hikes. Meals are served buffet style, with plenty of healthy but filling choices. There will be eggs available at breakfast and at dinner there will be vegetarian and non-vegetarian choices. On Saturday we will hike from the ancient village of Dufton to the quite breathtaking viewpoint of High Cup Nick. This mountain has been dubbed ‘The Grand Canyon of the Pennines’ and is one of the finest u-shaped glacier carved valleys in England. There are fantastic views from the summit taking in the dramatic geological formation at the top of High Cup Gill. We will start with a short minibus ride to the village of Dufton and then we follow the route of the Pennine Way to the summit of High Cup, with its dramatic views. We then head across the open moorland of the Pennines, before dropping down to the village of Murton and then making our way back along country lanes and footpaths to the Haybergill Centre. It is a fantastic walk but is slightly longer than our normal Saturday Hikes. It is approximately 11 miles with about 750m of ascent. On Sunday we will take a more leisure walk to explore the local countryside, rivers and villages. The walks may vary depending on the weather conditions at the time but we have lots of other options and variations to choose from. We will run a guided walk whatever the weather, so please come prepared! Walks are graded moderate, with approx walking time 6-7 hrs and distance 11 miles for the Saturday and less on Sunday. We have our own dedicated yoga room on the ground floor looking out over the gardens. We offer 4 classes during this weekend and we will stretch out our legs in between. On Saturday there will not be a yoga class before breakfast, as the High Cup Nick hike is slightly longer and more strenuous than our usual yoga hikes walk, so we will have breakfast and leave after breakfast. We will have a yoga session upon our return on Saturday to stretch out any stiff and tired muscles. On Sunday morning, there will be yoga before breakfast and then our hike, and return for our final yoga session. The yoga is varied and so will be suitable for beginners as well as for those who have practised before. 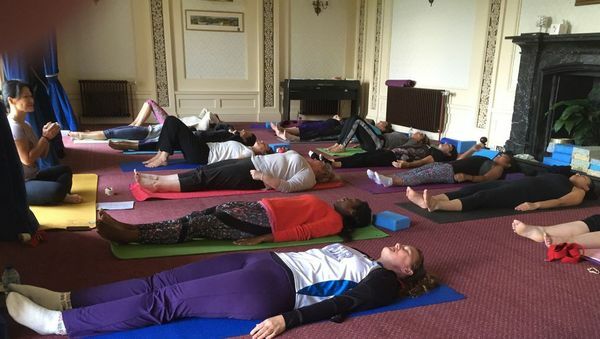 The general focus of the morning sessions will be to energise and warm up the body for our walk, and in the evening, will be to stretch out those tired muscles and relax the body. Yoga mats and props will be provided but you are most welcome to bring your own mat if you prefer. The owners have a long term commitment to running a sustainable, ethical, family business. It has a fantastic modern space for yoga and is very popular with yoga groups and so is ideal for our Cumbria Yoga Hikes group and we have the centre for the sole use of our group during our weekend. During spare time guests can enjoy the grounds and the close surrounding countryside, bird & other wildlife watching, walking. There is also a sauna and a stunning garden cabin and a purpose built open fire pit which guests are free to use. The balance (plus £15 if taking the transfer option) will be due within 8 weeks of the start date and you should arrange a bank transfer for this. Includes: Four yoga classes, two guided walks, meals (breakfast each morning, dinner on Friday and Saturday evening and lunches each day) and accommodation in twin share rooms or small dormitory. Does not include: Train or car travel to the Haybergill Centre. We are able to offer a optional train station pick up from this train.